If you haven’t noticed, I adore my pets. 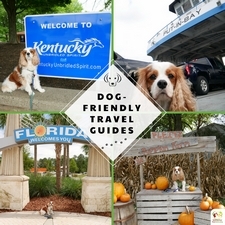 Dexter The Dog is my best friend and the best sidekick a girl could have. I love to be surrounded by things that remind me of Dexter or are from a part of his life. I have a few caricatures hanging in my room from pet events. I have a painting of his paw prints hanging above my bed. 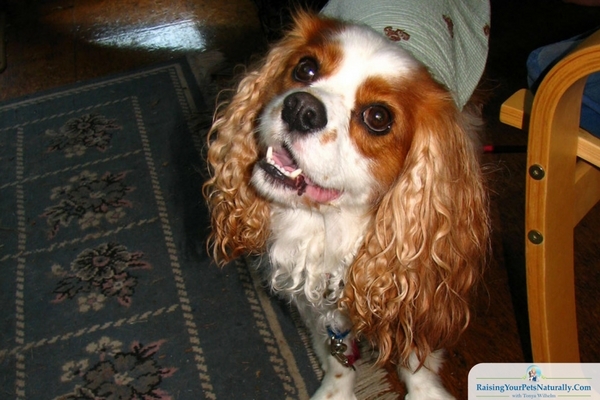 I have custom dog coasters with his image and loads of photos around and as my screen saver. But I have had one item on my bucket list for a long, long time and that was a custom pet portrait of him. Art is a very personal thing and comes from the heart. For me, I’ve always been drawn to bold colors, bright colors, and being happy when I look at art. 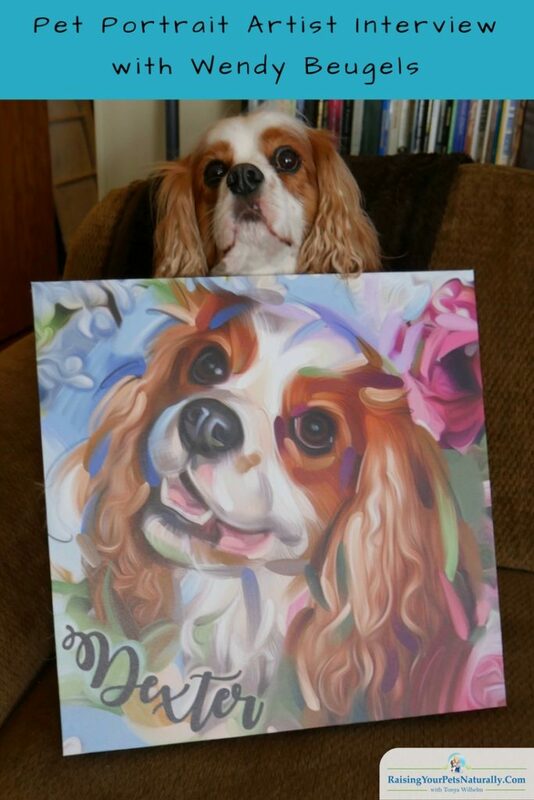 Finding a pet artist that specializes in custom dog portraits was actually pretty easy for me. 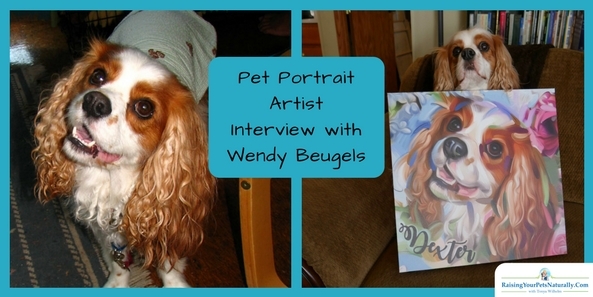 I’ve been following and ‘oohing’ and ‘aahing’ over Wendy Beugels’s custom pet portraits and paintings for years! I’ve shared her work on my personal Facebook page over the years, and have seen friends get their own custom pet paintings from her. Then, about a month ago on another one of my shares, my mom and step-dad surprised me with “we’re going to get you a custom digital print from Wendy!” OMG—I was ecstatic! I literally was jumping up and down like a little schoolgirl. 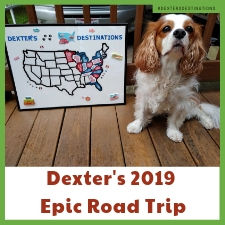 When I spoke with Wendy, she asked which portraits I felt a connection to, what my color theme was, and asked for a few photos of Dexter. I actually thought I would have a hard time choosing just one Dexter photo, but as I was browsing through the thousands of photos, one jumped out at me. My happy-go-lucky boy was smiling back at the camera, something he doesn’t do a lot of, and I knew this was the photo. It wasn’t long before Wendy sent me an image she created for approval, and I again started to squeal and jump around. Perfect! 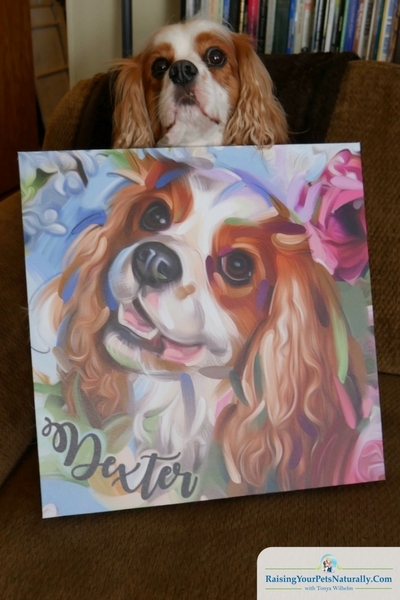 The custom pet portrait of Dexter The Dog was just stunning. I couldn’t have even imagined a better result. I sent the digital image off to my local Walmart to have printed on a 20 x 20 canvas. The print was actually printed from a Fuji lab, not Walmart’s in-house lab. Finally, after about a week and a half, the custom canvas was ready. Yes, I practically ran to the counter and ripped open the box to view the print. Seriously—I was blown away at how wonderful his portrait looked. The colors were vibrant, and it truly looked like Wendy had painted it right there on that canvas. 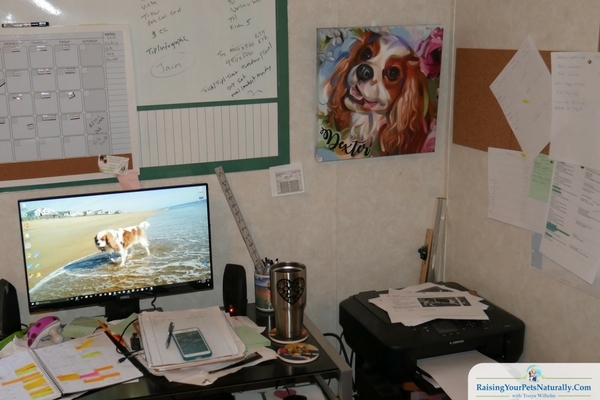 Some people may find my hanging placement odd, but I wanted to be able to view this canvas as often as I possibly could, so it’s in my office, next to my to-do bulletin board. I spend a lot of time at my computer, and this way I only have to turn slightly to see the print, and I can always see it/him out of my corner of my eye. Needless to say, I am more than happy with the entire experience working with Wendy and creating a special piece of art representing Dexter. I think she captured him perfectly. I’m a curious creature, so I asked Wendy if she would agree to a short interview. She kindly agreed. I hope you find her story and process as interesting as I have. 1. What inspired you to become an artist? Was there ever a specific moment or event? 2. What mediums do you currently use? 4. What inspires you most during a painting? 5. What is the most challenging part about doing custom work? 6. 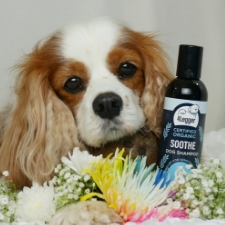 How did you end up with so many Cavalier clients? 7. Is there a subject or animal you find most challenging? 8. What is your favorite subject matter and medium? Visit Wendy’s website and Facebook page to view her amazing works of art. What do you think of Dexter’s digital art portrait? Tell me in the comments. Great Post! And a super cute puppy! I would love to have a portrait of my dog! Wendy’s work is awesome. I will have to check out her website. 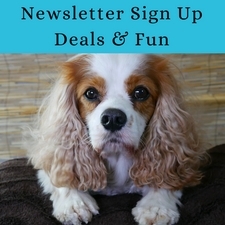 Thanks for the interesting read and for letting me know about her custom pet portraits. Wendy’s work would make awesome gifts! Great idea. That is an absolutely stunning portrait! I love how whimsical and colorful it is. The floral background is really cool! We have had some sort of portrait done for most of our dogs now and they are always so very special. Oh my goodness that is some talent! I have a hard enough time just capturing a picture of moving children , let alone painting a dog – impressive! Haha I bet photographing dogs and kids together would be really hard. Yes, Wendy is very talented. OMG these are so cute! It would be very challenging to take a photograph of our dog though (apparently he’s camera-shy, he actually turns AWAY from the camera or the phone). But this is definitely something I would love love love to have of him. Stay tuned. I’m interviewing a photographer on taking photos of pets. 🙂 I’ve learned if I drop the camera and I make eye contact with my pets, they are more apt to ignore the camera and look at me. So pretty! What a sweet idea. 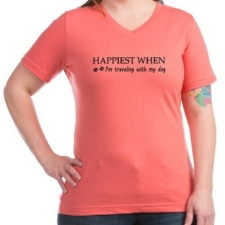 I bet my mother in law would love this! Wow, I really like her style and use of color! It’s really cool that Wendy is able to communicate with her customers and create meaningful portraits! Thanks. I just adore her use of color. She really captured Dexter’s personality. Wow that’s amazing! Wendy did a great job of re-creating Dexter. You have a very adorable puppy. Thank you. She really was able to capture his full personality. Great piece and some beautiful artwork. Don’t leave until too late to get. Best advice ever! Thanks. I just really wanted this before his passing (not that it’s coming up). I think that will keep the portrait with really good memories. What a bright, happy portrait of Dexter! I think she captured his spirit beautifully!! Thanks, DeEtte. She really did an amazing job. This is a cute idea. My parents would love to do this I am sure for their dog. 🙂 Wendy does any subject too. 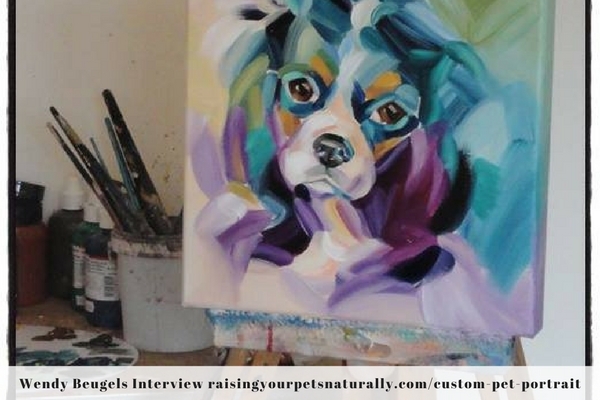 A custom painting of a pet would make an excellent gift for a pet owner. And nothing odd about where you put the portrait. I’d want it somewhere I can see it all the time too. Thanks. 🙂 It’s so nice to be able to see it most of the day. Awwwwwwwwwwwww!!! Your baby is adorable! 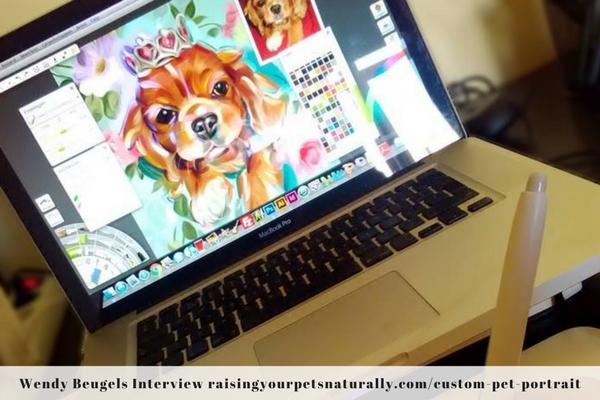 Is there a way to win a custom portrait painting of your pet? Thank you. No, the contest ended last year.